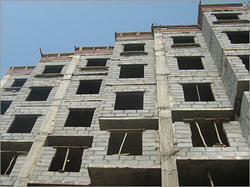 We are a leading manufacturer, supplier and trader of the AAC Wall Block. Our offered products are Autoclaved Aerated Concrete Block, AAC Block, and Lightweight AAC Blocks. We have gained much acceptance as notable manufacturers and suppliers of best in class AAC Wall Block. We introduce innovative and eco friendly technology to use the recycled fly-ash with quick lime and other quality ingredients to bring forth superior levels of workability and flexibility in construction. The offered wall blocks are developed using an aerated agent which makes it light in weight and renders the porous structure. Moreover, the economic and environment friendly wall blocks are accessible from us in various sizes and shapes at a market leading price. Looking for “AAC Wall Block”?